The Western Zhou dynasty 西周 (11th cent.-770 BCE) created two capitals, Zongzhou 宗周 or Hao 鎬 (near modern Xi'an 西安, Shaanxi), and Chengzhou 成周 or Luo 雒 or Luoyi 雒邑 (modern Luoyang 洛陽, Henan), yet the rulers stayed in the western region where their people had lived for some centuries. 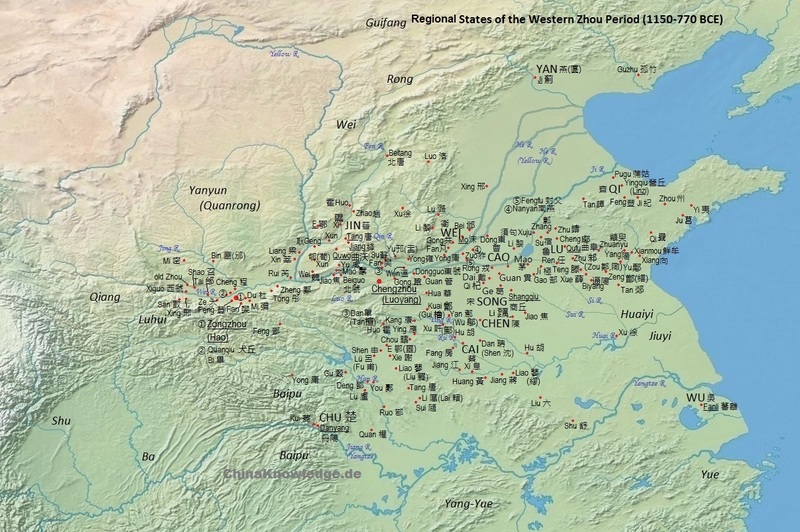 According to mythology, and supported by archeological findings, the Zhou people had formerly lived in Bin 豳 (also written 邠), a territory (in the map marked green) that was either located in the Fen River 汾水 valley in Shanxi or northwest of modern Xi'an. The older capitals of the Zhou tribe were Qi 岐 and Feng 豐, both also not far from modern Xi'an. After the foundation of the Zhou dynasty, King Wu and the Duke of Zhou invested kinsmen as rulers of territories (regional states) throughout the empire. Map according to Tan Qixiang 谭其骧 (1987), Zhongguo lishi ditu ji 中国历史地图集. Dots designate the seats of regional states, seats of larger states are underlined. The names of large states are in CAPITAL letters, the names of barbarian tribes in capitals. Click to enlarge. The Zhou controlled basically the Yellow River plain and the adjacent regions, as well as the region around modern Beijing. The politically most important regional states (zhuhou 諸侯) of the Western Zhou period were Jin 晉, Zheng 鄭, Wei 衛, Cao 曹, Chen 陳, Cai 蔡, Song 宋, Lu 魯, Qi 齊 and Yan 燕 (in the map in bold type letters). Except these there was a large amount of lesser states in the Yellow River plain, like Shao 召, Bei 邶, Yong 鄘, Tang 唐, Gui 檜, Jiao 焦, Zhu 祝, Ji 薊, Ying 英, Liu 六, Zeng 繒, Teng 滕, Xue 薛, and so on. These were swallowed by the larger states during the Spring and Autumn period 春秋 (770-5th cent. BCE). The regional states reigned only over a relatively small area beyond the city walls of their "capitals" (guo 國). The open land was called "wilderness" (ye 野). 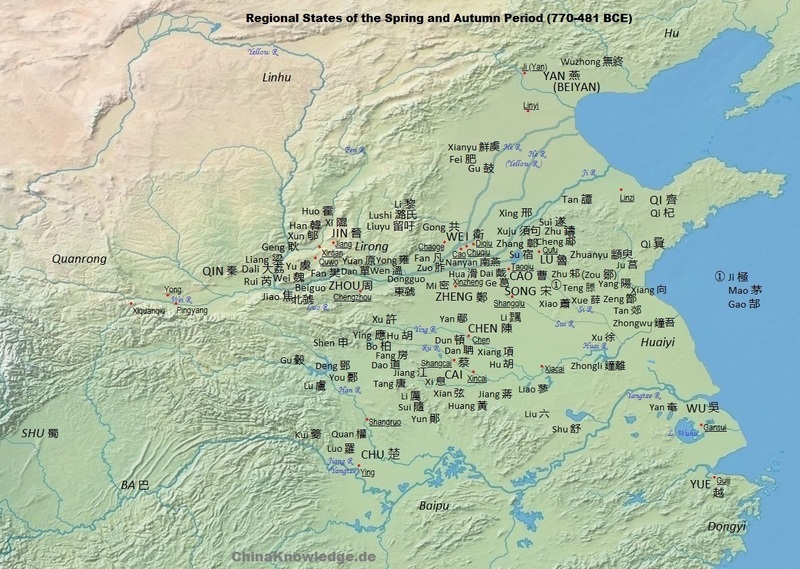 Especially in the region of modern Hebei and Shanxi, and also in what is today northern Jiangsu and northern Anhui, there were "barbarian" communities of peoples probably speaking languages different from the Zhou period Chinese. Such tribes were the Di 狄 in the north, and the Xu Yi 徐夷 and Huai Yi 淮夷 in the southeast. In the western parts of the early Zhou empire, there were rider peoples like the Quanrong 犬戎 or Xianyun 玁狁, and the Qiang 羌. The chieftain of the people of Qin 秦 was not yet granted an official investiture as regional rulers by the king of Zhou. In the far south, among the many Pu 濮, Yue 越 and Man 蠻 tribes, the strongest was the people of Chu whose ruler named himself "king of Chu" 楚. There was also a king of the Xu tribes, which shows that the idea of an universal "king" (wang 王) was not yet born in the early Zhou period. The Sichuan basin was controled by the native states of Ba 巴 and Shu 蜀 that had only loose contants with the states of the Zhou empire. Map according to Tan Qixiang 谭其骧 (1987), Zhongguo lishi ditu ji 中国历史地图集. Dots designate the seats of the larger regional states. The names of large states are in CAPITAL letters, the names of barbarian tribes in capitals. Click to enlarge. Under the attack of rider tribes from the west and the pressure of some opponents in the central government, the Zhou court had to flee the western capital in 770 BCE and settled down in Luo (Luoyang), the eastern capital. The following centuries are therefore called the Eastern Zhou period 東周 (770-221 BCE). They had now to rely on the support of the regional rulers (zhuhou 諸侯) to enforce their political decisions. The royal territory was substantially smaller in the old metropolitan region in the west and so also deprived the royal court from a decend income to sustain an army. Quite contrary to this situation, the states located in the periphery were able to expand their territories, often to the cost of smaller regional states. In the Spring and Autumn period, as this period of time is called, the states of Jin, Qin (now officially a regional state) and Qi became powerful players in the world of the Zhou empire. This is also true for the barbarian state of Chu in the south, and the newly emerged barbarian states of Wu 吳 and Yue 越 in what is today southern Jiangsu and Zhejiang. The smaller regional states in the centre of the empire like Song, Cao, Cai and Zheng, became more and more overshadowed by the larger states. The political weakness of the kings of Zhou had to be supported by the institution of hegemonial lord (ba 霸). This was not an administrative position, but one of the regional rulers who in irregular intervals was acknowledged by the others as a kind of leader. The role of hegemonial lord was taken over by Duke Huan of Qi 齊桓公 (r. 685-643), Duke Wen of Jin 晉文公 (r. 636-628), King Goujian of Yue 越王句踐 (r. 495-465), King Helü of Wu 吳王闔閭 (r. 514-496), and King Zhuang of Chu 楚莊王 (r. 613-591). Fights among the regional states were most heavy among Wu, Yue and Chu, and Wu was the first large regional state that perished. In the other states, critical changes took place. The state of Jin collapsed by the fights among the ducal house and the six ministers commander (liu qing 六卿) of Zhonghang 中行, Zhi 智, Fan 范, Han 韓, Wei 魏, and Zhao 趙 at the beginning of the 5th century BC. The last three were able to crush the house of Jin and established their own regional states in 376 BCE. In the state of Qi the ruling family of the house of 姜 was replaced by the house of Tian 田 in 481 BCE. In Lu, the state where Confucius hailed from, lateral lines of the ducal house, the three Huan families 三桓 usurped power. Map according to Tan Qixiang 谭其骧 (1987), Zhongguo lishi ditu ji 中国历史地图集. Red lines symbolize territorial borders in c. 350 BCE (not for smaller states), violet lines represent defensive walls against other states or raids of wild tribes. The names of barbarian tribes are in capitals. Click to enlarge. From the 5th century BCE on the large state of Chu in the south expanded into all directions and swallowed the state of Yue in the east. Yan, the northernmost state, was able to invade Qi, but after recovering, Qi also expanded to the south. 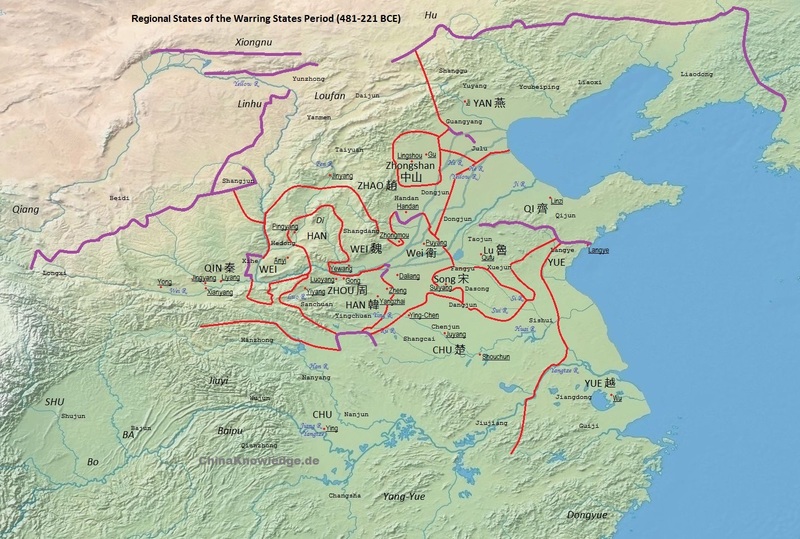 For Yan and Qi, the states of Zhao, Wei and Han in the centre of the Zhou empire constituted an important buffer zone to the west, where the state of Qin gained ground. Before thriving hard to the east, Qin conquered the region of the Sichuan Basin, where the states of Shu and Ba were located. From there, and the Han River valley, Qin was able to initiate campaigns against the state of Chu. In 221 BCE Qin had conquered all regional states and founded the Qin empire 秦 (221-206 BCE). For a short time between 414 and 295 BCE, there was a state called Zhongshan 中山 in the border region between the modern provinces of Hebei and Shanxi. The royal house of Zhou had in the meantime split into an eastern and a western branch, making the kings of Zhou even more pure symbolic figures. In the region south of the Yangtze River there were still native tribes whose territory was not yet incorporated into the Zhou empire, like the Pu 濮, the "Hundred Yue" 百越 and the the Yang Yue 揚粵. In the northern steppe zone, there were the Eastern Hu 東胡, the Xiongnu 匈奴 - which were later to found a mighty steppe federation -, and the Tokharians (Yuezhi 月氏) that were of Indo-Iranian stock. The states of Qin and Yan built large fortification walls to prevent these northern rider peoples from making raids on "Chinese" territory. These, as well as fortification lines (black lines in the map) between the regional states, were forerunners of the famous Great Wall.